USS John F. Kennedy is named after the assassinated 35th President of the United States. The ship was built in Newport News, Virginia and commissioned on Sept. 7, 1968. Carrying the nickname, “Big John”, the ship underwent initial trial runs along the eastern seaboard. Her maiden voyage was to the Mediterranean. Over the next few years, the ship would return to the Mediterranean many times. She also participated in exercises with NATO forces at different times in the Atlantic and Arctic Oceans. In the first half of 1974, the ship underwent its first major renovation to upgrade its combat abilities. For the rest of the 1970’s and into the 1980’s, she continued visiting the Mediterranean along with other Atlantic operations. In 1983, John F. Kennedy was sent off the coast of Lebanon after the Beirut troop barracks were attacked. In 1984, she underwent another renovation. Returning in 1986, the ship was deployed to the Mediterranean again to patrol against Libya. In 1990, the ship was sent to the Persian Gulf to support the first Iraq war. After the cessation of hostilities, she was again sent to the Mediterranean many times. At the beginning of the millennium, “Big John” was sent again to the Persian Gulf to send sorties against Afghan targets. In 2005, the decision was made to decommission the ship due to upkeep costs. On March 23, 2007, the ship was formally decommissioned. John. F. Kennedy (CVA-67) was laid down 22 October 1964 by the Newport News Shipbuilding & Drydock Co. Newport News Va.; launched 27 May 1967; and sponsored by Miss Caroline Kennedy daughter of the late president. 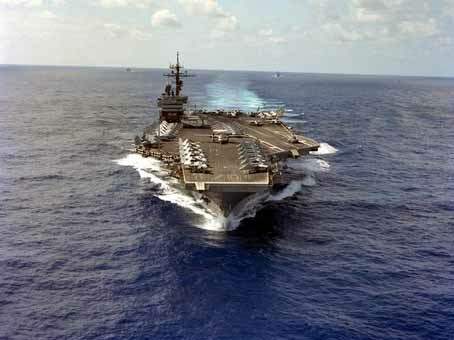 Commissioning of the carrier is scheduled for the fall of 1968.